Some time ago I read a post titled Rescuing Picture Books from Extinction. In that post Kim Yaris expresses dismay that picture book sales are seeing a decline, but she goes on to explore why, and also provides a personal anecdote. I, too, have heard that picture books will fall at the feet of e-readers and that the era of the printed picture book is dead. But to paraphrase Mark Twain, "Reports of their death have been greatly exaggerated." Want proof that picture books are alive and well? Check out some of the latest Scholastic titles to hit the shelves. These are the types of books that beg to be read in their original large-size format. These are also the types of books that prove that the language of picture books is just as challenging as equivalent-grade (or higher!) chapter books. In the tradition of The Steadfast Toy Soldier, Captain Sky Blue tells the tale of a favorite toy that once lost, finds its way back to its owner through a series of misadventures. In addition to Richard Egielski's bright illustrations, young readers will love the "pilot talk" liberally mixed throughout the narrative. Aviation terms such such as wilco (I will do it), jink (a quick move to escape danger), spooled up (excited), and brain housing group (a comic term for the skull) introduce students to the idea that jobs and activities have a specialized jargon all their own. Ask students to interview parents or other relatives to collect a list of terms which are job specific. Share these in class and discuss why people have developed these lexicons within their vocations. Students may want to share other precise terms they know from sports, music, and other free-time pursuits. Assign students a term for research. To what activity or vocation does it refer? What are its origins? Hat trick, for example, refers to three points or consecutive wins by the same player, whether in ice hockey, cricket, or horse racing. Its origin is the hat traditionally bestowed for this accomplishment in cricket (via Wordnik, a pretty cool online dictionary). 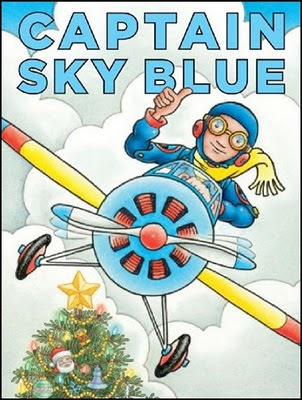 Two themes of Captain Sky Blue are Loss and Determination. Share and discuss other books which explore either of these themes. 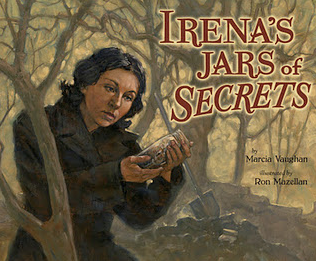 Challenge students to write their own tales, using one of the mentor texts as a model. 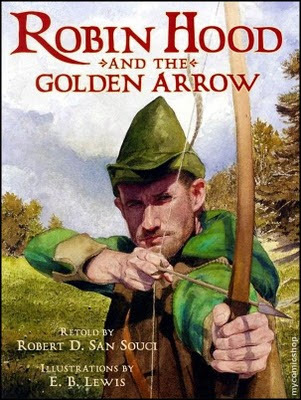 Robin Hood and the Golden Arrow retells the classic story in which Robin Hood, disguised as a one-eyed beggar, bests the Sheriff of Nottingham's favorites to win an archery contest, a contest designed for the sole purpose of catching Robin and his Merry Men. To us this is a familiar tale, but to many students it's brand new! Author Robert D. San Souci describes his source material in an afterward, and I'm pleased to see that he references Howard Pyle. Howard Pyle's retellings are those that I read as a boy, and to this day my ragged copy is a part of the classroom library. But E.B. Lewis' saturated illustrations make this tale new even for me, and I can't wait to share this book with my students. Ask students if they can name other books in which one character devises a plan or mischief to catch another. Why are these stories such fun to read? What makes us root for one character or another? Why in this book did Robin Hood reveal his identity to the Sheriff of Nottingham instead of maintaining the ruse? Share other Robin Hood tales with students. Equally famous is Robin's chance meeting with Little John at the middle of a log crossing a stream. Neither man will give way. After reading this tale, ask students: What else could they have done to solve this problem? Can anyone suggest a possible compromise? If they hadn't disagreed in this manner, would their resulting friendship have been as strong? 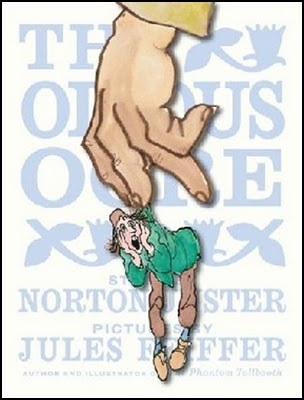 Norton Juster and Jules Feiffer, the author and illustrator of The Phantom Tollbooth , team up again in The Odious Ogre . This story of an ogre who is "extraordinarily large, exceedingly ugly, unusually angry, constantly hungry, and absolutely merciless" contains some of the most amazing language I've seen in a picture book in a long time! You see, the ogre in question has "an impressive vocabulary, due mainly to having inadvertently swallowed a large dictionary while consuming the head librarian in one of the nearby towns." "No one can resist me... I am invulnerable, impregnable, insuperable, indefatigable, insurmountable." While the lesson of this book (kindness wins over odiousness) might be a selling point for some, it's the language that wins me over. Use this book to introduce students to adjectives and adverbs. I'll admit, at first I was staggered by the words Juster employs, yet they work! How do I know? My first read through was with my seven year-old, who selected the book from the stacks of dozens beside my desk. As she listened to me read the book aloud, she didn't know what several of the terms meant, yet she "felt" what they meant, and she only asked me about a couple of them in a second reading. Truly a testimony for the power of learning vocabulary in context! 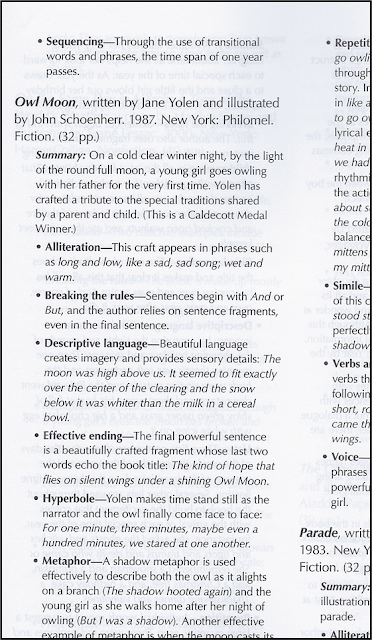 Assign each student one of the book's wonderful words to research, define, use in a context sentence, and illustrate. If you haven't already done so, create a "Said is Dead" wall. Revisit The Odious Ogre to collect wonderful speaking tags such as whimpered, sobbed, offered, assure, grunted, admit, mumbled, and insisted. Then ask students to revisit a narrative of their own to revise the dialogue with more exacting language. Instead of she said sadly, a student might write: she lamented, she whined, she whispered with dismay. Each of these expresses sadness, but in different ways. Discuss the book's message. The book's last line reads, "She also understood that the terrible things that can happen when you come face-to-face with an Ogre can sometimes happen to the Ogre and not to you." What does that mean? Can this book teach us a lesson about how to respond to people who treat us with odious manners or words? I look forward to seeing more fabulous picture books from Orchard Books and Michael Di Capua Books. Glad to see that Scholastic is still in the game! If you're here at this site, you're most likely interested in teaching with picture books. You recognize that these models provide excellent examplars for word choice, idea development, story structure, and many other skills and traits. You know the importance of using mentor texts when teaching author's craft to your young writers. But how do you- a busy teacher with only so many hours in a day - find great mentor texts? With so many children's books available and so little time to peruse them all, matching books to writers' workshop mini-lessons remains a challenge. That challenge is met in I Can Write Like That! 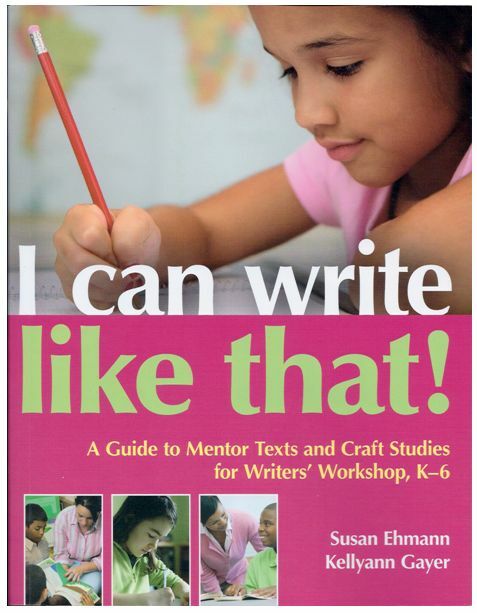 A Guide to Mentor Texts and Craft Studies for Writers' Workshop, K-6 , an International Reading Association title by Susan Ehmann and Kellyann Gayer. In these pages you'll discover engaging fiction and nonfiction children's books and ideas for using them to their maximum potential as teaching tools. And you will find new ways to give your students a priceless gift - exemplary models for their own writing. Realize the reward of having your students listen to a well-written story then identify the author's craft and say, "I can write like that!" I was frankly surprised to see that half the book consists of annotated lists of picture books; upon closer inspection, however, I realized that this feature makes sense. So many teachers in workshops have come to me and said, "I have so many of those books in my classroom library, but I never really knew before how to use them for instruction," or, "I want to create a core collection of really great books, but I don't even know where to start." My wife, a kindergarten teacher, confirmed the value of the lists. As she looked through the annotations, she remarked, "This is pretty cool. If you already own one of the books, you can see what skills to focus on. Or if you want to teach a mini-unit on a single skill, such as repetition, you can use the chart and choose books from there." 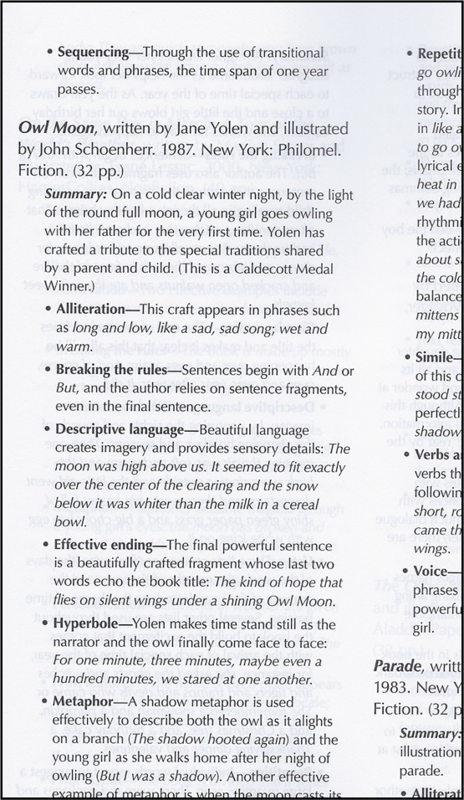 Part I: Craft Elements provides detailed descriptions and teaching points for working with craft elements such as alliteration, breaking the rules, flashback, leads, personification, text features, and voice, a surprising twenty-seven craft elements in all. Part II: Selected Craft Study Lessons features sample lessons, providing teachers with models for their own instruction. Part III: Mentor Texts to Demonstrate Craft Elements contains an expansive matrix, aligning hundreds of new and classic picture books with the twenty-seven craft elements, followed by a through breakdown of these books by element (see figure to the right). Two Appendices feature student recording sheets and additional reading lists for teachers. You and your colleagues will refer to this resource again and again. I'm incredibly honored and excited to participate in KidLit Celebrates Women's History Month, a fantastic month-long blogging collaboration hosted by The Fourth Musketeer and Shelf-Employed, featuring thirty wonderful bloggers and authors from across the kidlitosphere (you can see them all listed in the right hand column at the blog). Why celebrate women's history and children's literature? Not so long ago, women's history was virtually ignored in the K-12 curriculum. 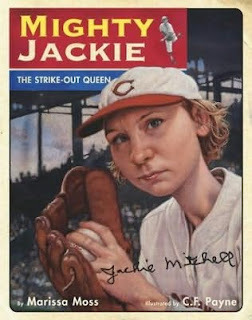 In 2011, we are fortunate to have many resources for our children to learn about women's history, from fabulous biographical picture books about remarkable women to historical novels to compelling history books written to especially appeal to young people. We hope this blog will help you identify some of these resources, learn about new books on women's history, and enjoy reflections by some distinguished authors in the field. We will be featuring a post each day in March by a different author in children's literature or by a blogger who specializes in writing about children's or young adult literature. Each post will tie into Women's History Month. Check in every day to reap the fantastic book recommendations and resources offered. While I'm probably the least talented and interesting person participating, I'd also invite you to stop by and check out my post today! Don't be too shy to say hello in the comments!